My favorite item is the Chloe bracelet. Thanks for the great contest! I love handcrafted items but am easily overwhelmed by the sheer volume of stuff available on sites like Etsy. It's fun to peruse all of the goodies for sale but I have lost countless hours clicking through so-so shops looking for something specific. It's easy to get fed up. The Pear Project is an online boutique featuring artisan goods that have been pared down (pun totally intended!) to the best and the brightest. Brooke Fuller's mission is to incorporate artisan goods into everyday life. 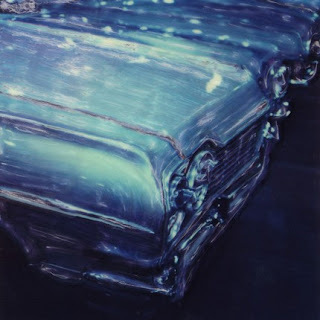 She founded The Pear Project to showcase her own artwork, like the Car in Blue manipulated Polaroid SX-70 print below, and that of other artisans. To enter and win a Kbags Reusable Grocery tote by Karen Parrish (a $32 value) filled with other handcrafted goodies, including Sara Sacks' adorable koi fish chiyogami Scrabble tile necklace (an $18 value) pictured below, a fine art print of Car in Blue by Brooke Fuller pictured above (an $18 value) and a packet of coupons from independent artisans, please comment on this post with your favorite item from The Pear Project. Entries will be accepted through October 15th and I'll pick the winner using Random.org. US readers are eligible. Only one entry/comment per person, please. For an additional entry, post my button on your blog or subscribe via email or reader and leave an extra comment letting me know. we are subscribers and we have your button! I love the Chandelier Vinyl Wall Art! So cool! I especially like the koi necklace. I love koi, but sadly that word has a bad meaning in Lao. It sort of pervs it for me. I'm loving the Chiyogami Salt & Pepper Set! This was hard to pick a favorite because they have a lot of great stuff over there! Wow! I think the Red Burst Pillow is my favorite though. Extra entry please - I have your button on my sidebar. Another extra entry please - I am subscribed via Google Reader. Fabric Tote Bag is my favorite, there are so many pretty things too. I like the Six Cents necklace. Cool stuff! I love the Lime Hobo. and I know just what you mean about Etsy, love it and get lost there every time. The White Pussywillow Napkins would look so amazing in my newly redecorated dining room!! Let's start with Round X-Ray Butter Knife Tote, then the Gertrude Bracelet and finally the Fabric Tote Bag. Too many cute things to pick just one favorite. I love the copper wire ring too. Many thx. My favorite is the Bird in Paradise Pillow. my favorite item is the April Necklace. I like the Erica earrings. Simplicity on Spa Blue is a beautiful simple design that looks stunning. The pillow would add elegance to any sofa or bed. love the Chandelier Vinyl Wall Art! I honestly love so much of the Pear Project, but the goldfish necklace really makes me smile. Seriously. Goldfish are so cute! I have to say first that I think I like the clever name of this post! You never cease to make m laugh. This featured site has several items that I fell for right aay. I thin my fave is the Chandra Earrings. They are simple yet pretty and the perfect accessory for Fall. I am also a new subscriber. The train art is nice! That's a really cool site, especially because like you wrote, it's hard to find some nice stuff on Etsy after having to sort through a lot of well-intentioned but not necessarily well-made material. I'd say my favorite item is the Sakura on Sage clutch. A bag freak like me can't have too many bags. And of course I have your button. My favorite piece is the Emerald Flowers Necklace. Thank you. I love the Socura on Sage clutch! I too love all things handmade! I love the Ali Bag in green-it would be a cute diaper bag for me! I love the Red Burst Pillow. It would look great in my living room. Their throw pillows are such lovely colors -- I especially like Simplicity on Spa Blue. So many goodies! I love the "sakura on sage" clutch, the pink hobo bag and the "Simplicity on Spa Blue" pillow. My favorite item s the GreenLea bag in black and white. I also like the green bee bobby pins because they are so ladylike. I really like the the steampunk and celluliod necklace-it reminds me of the work of Judy Hubbard. Love the Kook Whoo Necklace. Gorgeous stuff! I'd have to say my favorite is the April Necklace. Stunning! Thanks so much! Hi, I loved the Angie bracelet, even more so because it was on sale! My favourite item is the Teal on red mini-pouch. A great artisan site. I love the GreenLea Bag in Pink & Green; it was tough to choose only 1 favorite. Chiyogami Salt & Pepper Set is my favorite thing. DIY button ring kit! how fun! Chandelier Vinyl Wall Art would be my pick! Thank you so much for the chance to win such a great prize! I love the reusable grocery bags!! I need to get some -- I really don't like using plastic!! Wow, everything is so unusual and beautiful! My favorite is the Jelly Fish print. Just fell in love with that sweet little hedgehog on the coasters. Don't see hedgehogs much here in Pennsylvania but when I lived in Scotland even in the city where I lived in Glasgow you couldn't hardly enter a green space without encountering a hedgehog. They are quite friendly and unless threatened by a dog or a cat will not run when encountering a human. Little buggers are always open for a treat such as a piece of meat as they are carnivores. But they are nice people. So many great things... my favorite is the Silk Screened Deco Swirl in 3/4 Sleeve, so hip and chic! Tons of things I liked, one being the Chocolate Pussywillow Napkins – Set of 2. I'd love to have a more elegant place setting and the White Pussywillow Napkins – Set of 2 would be perfect! Thanks! I love the tees, especially the Silkscreened Flower and Graffiti Swirl Tee. It's such a fun, bold, print! and the owl cutouts. I LOVED alot of the purses too!!! I love the Fabric Tote Bags. I really like the 3 birds wall art. How cute! Thanks for the great contest! I really like the train print. I love the GreenLea Bag in Black & White. so classy. I love the Blossom Necklace! I like the Eleni Earrings. I like the Creative Block Notes. I think everyone in my family could use them. The idea of editing the sites for the best productis is great. I love this little clutch purse! I like the fire enamel necklace. the Simplicity on Spa blue linen pillow.....lovely! I love the red silk screened mod bubbles tee! I subscribed via email. Thanks! What a great idea to pull together all the best! I adore the blossom necklace! It's so cute and kind of dainty, and it would go with all kinds of outfits! I like the Silk Screened Mod Bubbles Tee. I like the tiny owl earrings! They are cute. I love the Bird in Paradise Pillow- thanks for the chance to win! saving the planet, 1 bag at a time! My favorite is the blossom necklace. 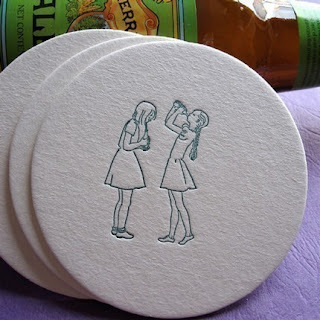 I love the Letterpress Branches Set of 8 Coasters!! I love the vinyl wall owl decal. I'm partial to the Bird in Paradise Pillow. I think that the Copper Wire Wrapped Ring is really unique. A one of a kind. Chiyogami Salt & Pepper Set is my favorite! I really like the Gertrude bracelet by artist Brooke Fuller. I like the Blue & Green Wire Wrapped Ring. I like the yellow hobo. I love the Bird in Paradise Pillow. Pretty. the fork love post cards are great! I love the pair of hot dogs print. It would look great in my kitchen. My favorite is the Simplicity on Spa Blue pillow. Thanks! My favorite is the Black Apple Purse. I like the Sakura on Sage Clutch. I love the April necklace!! the Eleni Earrings are beautiful - I love blue earrings! I love the Candice Earrings! SOOO PRETTY! The Silk Screened Mod Bubbles Tee in Chic Black of course and the Eleni Earrings because of the color combo and clean, classic design! I love the Cady Briar Brown & Pink Purse. I am always looking for new bags. Thanks for the chance to win. I love it ALL! But my favorite is the White Pussywillow Napkins. Thanks! Ohhh the Fire Enamel Necklace is beautiful! I love the Happy Birthday Octopus Letterpress cards! They're adorable! Oh I love Koi fish! All the prizes are fabulous. Thanks for the chance to win! I like the GreenLea Bag in Black & White. The GreenLea Bag in Black & White is my favorite. What a beautiful website; I really love the 3 Birds Vinyl Wall Art! I love all of the reusable grocery bags and the hobo bags...can't seem to chose a favorite design! Enter me please to win this great prize!! i like the blossom necklace. Very nice site with a great selection of items at reasonable prices. I love the beautiful April Necklace. Thank you for another great giveaway. I love the Classical Music Necklace. Thanks!! I think the Chiyogami Salt & Pepper Set is really nice. Thank you! The Elini Earrings are my favorite! I like the "Black Apple Purse"
I love the Simplicity on Spa Blue pillow. Thanks! I love the Jelly Fish print. I like the Green Leaf Bag in Black and White. Love the Emerald Flowers Necklace - it's so pretty but sophisticated. I am a train fanatic and I really like your train art. I have been looking for some wall art and the Tree Vinyl Wall Art is exactly what I am looking for! I added your button to my BLOG! They have so many nice things, I really like the Chiyogami Salt & Pepper Set. Loving the black/white bag, so sophisticated! I like the Violet & Mums Purse the best. Very cute. I like the black apple purse the best. Thanks. 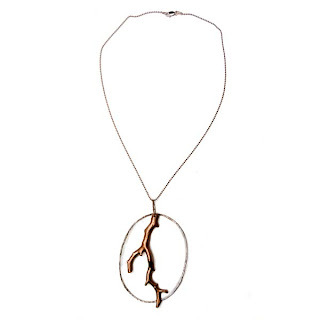 Christina - xristya@rock.com - I like the Classical Music pendant/necklace from The Pear Project. My 18-yr.-old niece Sarah just began studying music (sax and clarinet, primarily) at the university and she would wear this piece forever although I myself don't even read music (although I appreciate Rachmaninoff!) and wouldn't know if the notes meant something or not! love the grocery bag & the koi fish necklace - very original! The Yellow Hobo is my favorite! I have seen these a few times before and really think they are very pretty-the Chiyogami Salt & Pepper Set-love the design! Holy moly! this store is really fantastic, i love everything you guys are giving away. What a wonderful shop! I like the Jelly Fish print. It really caught my eye. The Silk Screened Deco Swirl in Short Sleeve is my favorite! I love the Yellow Hobo Prse. It's very cute. I love the goldfish necklace. great products! they make me smile! oops....duh...I love the abbey necklace! i love when design takes after nature! I MUST HAVE the red tote bag. Love it! Thanks for your great contest. I especially like the koi necklace. I love the Sakura on Sage Clutch. my favorite is the april necklace. There are so many great items, but my fave would probably have to be the Emeralds Flower Necklace. My favorite is the Simplicity on Spa Blue Linen Pillow. I really love the Fire Enameled Necklace. Lots of nice things really.